Dual Enrollment opportunity is now available to Southwest High School students. What is Dual Enrollment? 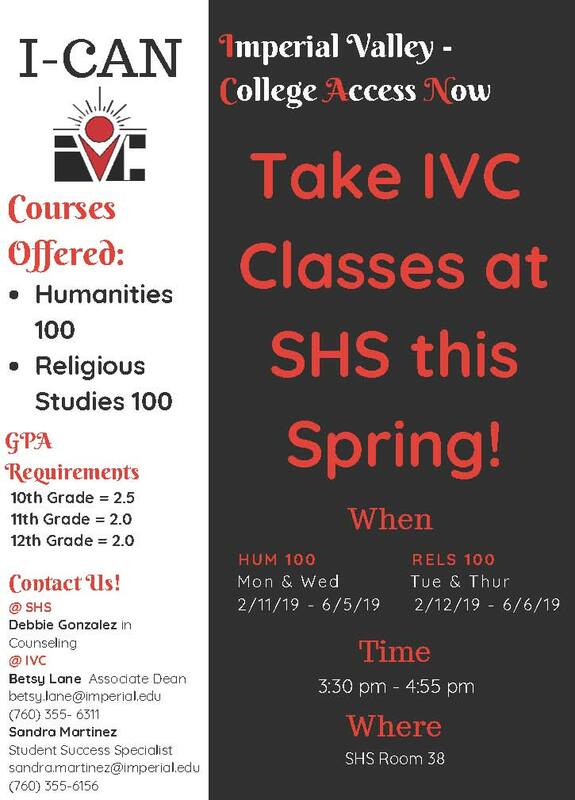 Dual Enrollment courses are college courses offered on our campus through IVC. A Dual Enrollment course is a course that gives you credits on a transcript at BOTH IVC and Southwest High. These courses are offered after school, free of charge. These courses can help get you ahead in credits so that when you graduate from high school, you have already accumulated college credits. The hang-up might be, however, that these are college level courses and may be difficult. If you register for a Dual Enrollment course, everything is done through IVC and IVC’s rules apply. So, to ensure that you don’t mess up your college transcript, you have to ensure that if you enroll, you attend every day and do your homework. Your grade matters, particularly when it comes to being able to enroll in future college courses as well as being eligible for financial aid. IVC operates under the notion that you can drop a class within the first two weeks. After the first two weeks, if you drop a class, you receive a “W” on your transcript as you have withdrawn from the course. These can negatively affect you. If you get an “F” (or other bad grade), it is permanently on both your high school and college transcript. You MUST be serious about enrolling when you enroll, but it is an EXCELLENT opportunity to get started on your college education FOR FREE! Visit the Counseling Office for a list of classes offered and to sign-up with your counselor. *minimum GPA to enroll is 2.5 for 10th graders and 2.0 for 11th & 12th graders. Students must complete IVC Registration and Dual enrollment application.